Learning to cook well can cost a lot of money which is why a free cookbook can be handy. This is a fantastic offer from Entyvio. 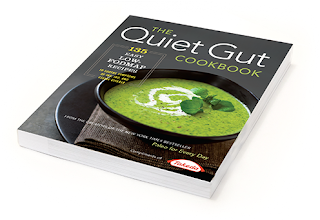 Entyvio is offering a copy of the Quiet Gut Cookbook. The book has 135 easy-to-follow recipes with detailed food lists, pictures, and guidelines. All you have to do is head on over to the Entyvio website to register for the Quiet Gut Cookbook. You can find out more about this fantastic offer and register at the Entyvio offer page at the following LINK. This is a fantastic offer and won't last for long. The cookbook will be delivered within 4 to 8 weeks. The offer could be withdrawn at any time so hurry. This offer is based on a first come first served basis so don't miss out. Feel free to share this cookbook offer with other people who might find it useful. If this offer has been expired, don't worry. I'm always on the lookout for health freebies so watch this space. I really hope you enjoy this cookbook.